This is a deliciously dark homemade chocolate cake made with black cocoa and coffee. 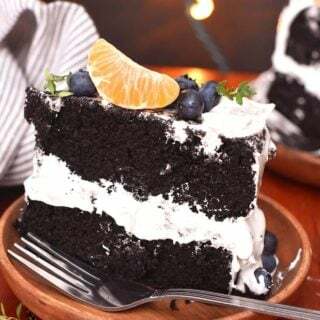 A deliciously flavorful cake! 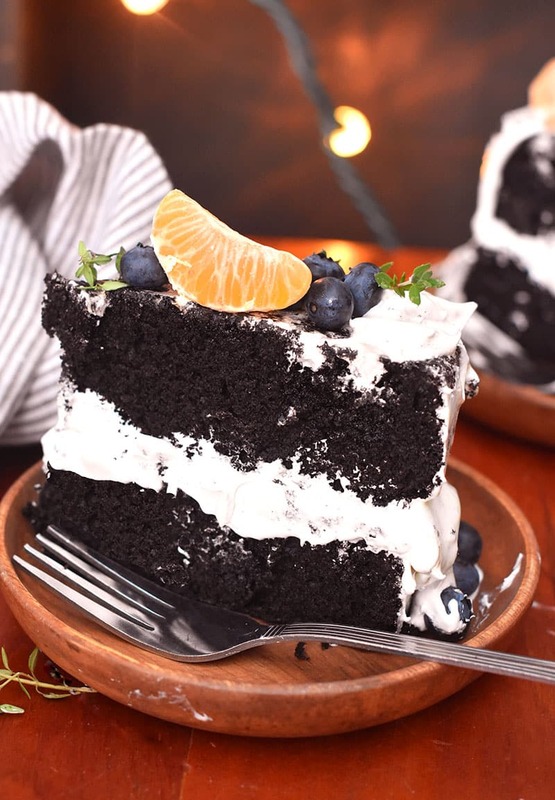 This is the ultimate dark chocolate cake recipe made with black cocoa and coffee (instead of the traditional boiled water)…a delicious grown-up cake recipe that is begging for a creamy whipped frosting, fruit, and herbs piled on top! The most popular on my site, by far, is my other chocolate cake recipe. That recipe is a traditional, birthday cake, sheet cake or layer cake, everyone loved this cake kind of recipe. A go-to. Why, then…do you not just make THAT cake? –> That is the milk chocolate candy bar. Almost everyone likes it. Some LOVE it. Some tolerate it. But it is a safe and well-liked classic. 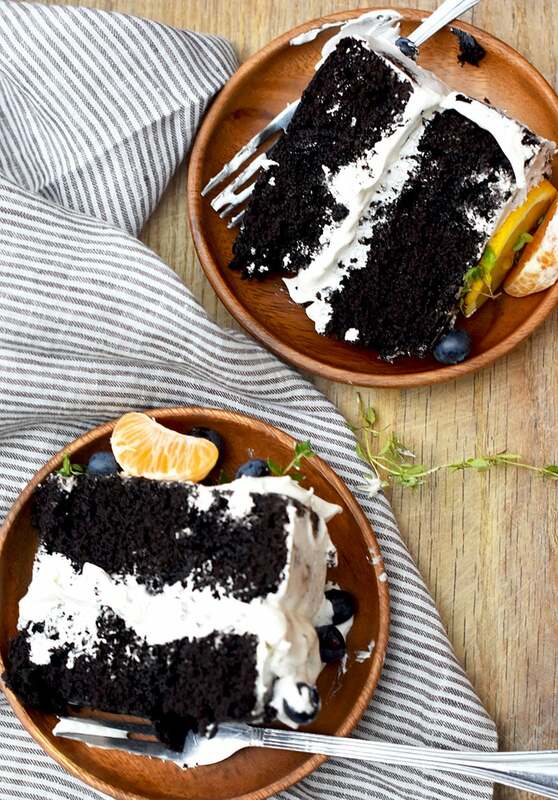 This cake recipe is like the dark chocolate candy bar. It’s not alot of people’s favorites. Some really don’t like it. But some LOVE it. Some would go so far as to say they won’t have anything else. I’m in the latter category. I’m the dark chocolate bar lover and find milk chocolate far too sweet. Most chocolate cakes are not my thing. This one is a favorite of mine and always served with a creamy top, fruit, and herbs. You could almost pretend it’s savory :). Baha!! I made a chocolate cake recipe that is good for you. Yeah, not quite. But it IS going to have you calling friends over and opening a bottle of wine. 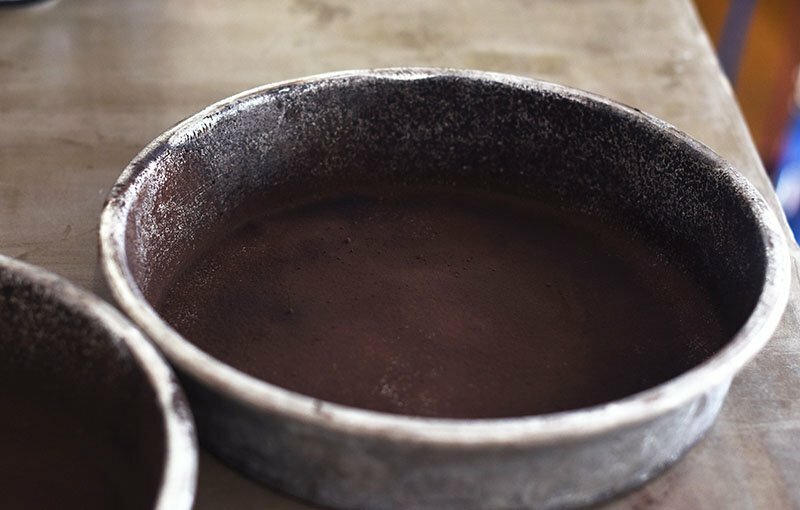 Use cocoa instead of flour to coat your cake pans. 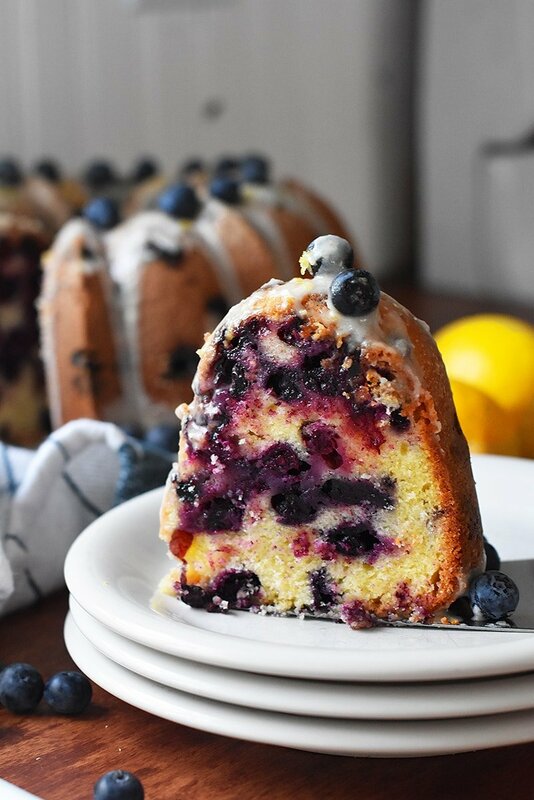 You will get better flavor and won’t have blobs of flour along the outside of your cake. By the way, this cake works just as well in a 9 by 13 pan if you don’t want to do a layer cake. Here’s the thing, though. I really don’t recommend a sweet frosting with this cake unless you plan to serve it up for a gathering or party. A simple whipped cream or ricotta is about as sweet as you want to get. Which, my friend, means the filling is EASY and a layer cake won’t be anything to do. You’ll look sooo fancy soooo fast! First, we have to talk about black cocoa. Most have never used it. Heck, a fair number of you have never heard of it. No shame in that game. It’s a rare thing. Think about Oreo cookies. You know that super dark color and flavor? Yep, black cocoa has that kind of thing. It’s super dark in color and concentrated in flavor. 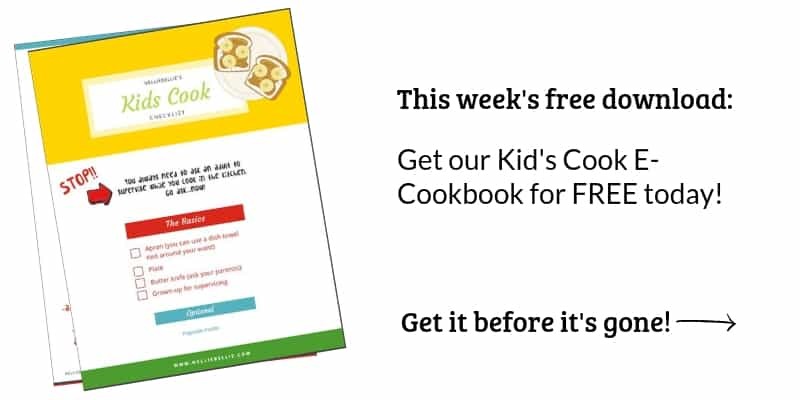 You CANNOT sub black cocoa for regular cocoa in recipes. Don’t try it. Promise, it doesn’t work. You use boiling water (in this recipe…boiling coffee) to “bloom” the cocoa AND to help it dissolve without clumps. It’s a two-fer and not to be skipped! Using coffee in place of water in your chocolate cake recipe OR adding a tablespoon or two of espresso will deepen the chocolate flavor. Coffee brings out the chocolate flavor in baked goods. The batter for this cake is magnificent. Deep in color, it almost looks like a brownie batter. So good! Fair warning…this is a thin batter and you’ll be a bit skeptical. But don’t worry, it rises nicely. I realized after I took the photos that there is a fairly random orange sitting on top, all alone. Sigh. I’m not re-taking those images. This cake was piled high with berries and oranges and lemon and thyme. And then sliced. This poor slice got a random, albeit sitting tall, slice of orange. This, friends, is an amazing little slice of cake. Not too sweet, not too moist, not too heavy, not too light. And perfectly dark. Just the way I like it. You really can’t go wrong with a creamy topping, fruit, and fresh herb combo. The best! Most kitchen stores like Sur La Table (where I got mine), and Crate and Barrel have it. Some Whole Foods and similar stores will have it. Or, simply order it online. King Arthur Black Cocoa is the only brand I use of it and you can grab their black cocoa HERE. See, easy peasy! You can easily have that black cocoa in time for the weekend! Call some friends to come over, buy a bottle of wine, and eat cake with your people! 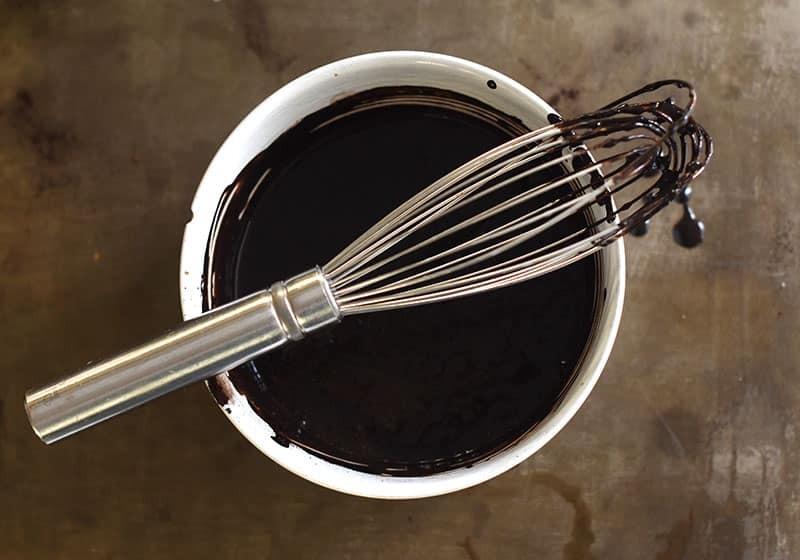 Grease and add cocoa (instead of flour) to the bottom of 2 8 inch round cake pans. 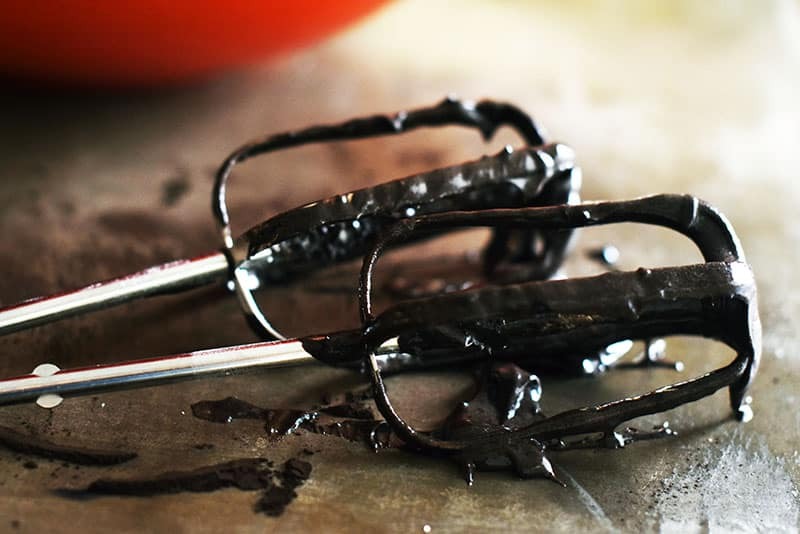 Combine butter, sugar, baking powder, and salt in the bowl of a stand mixer (or use a hand mixer). Cream until thoroughly combined. Add eggs one at a time, mix well after each addition. 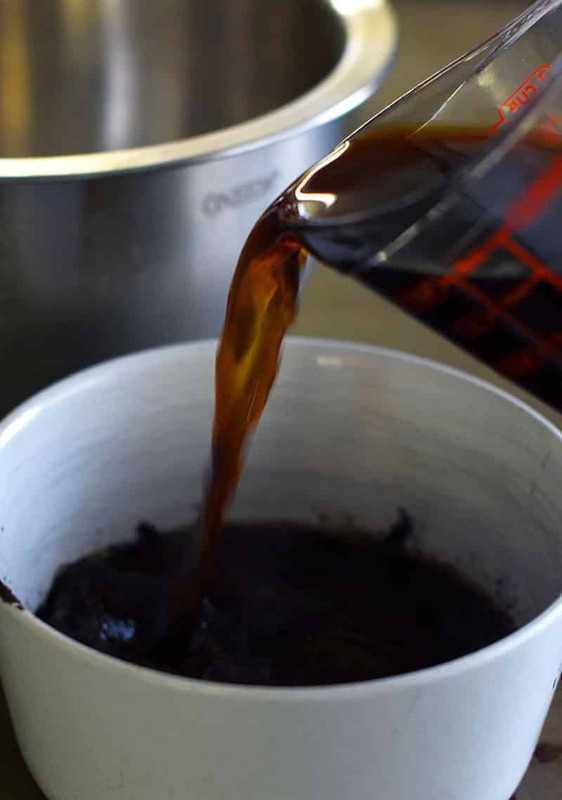 In a small bowl, slowly pour the hot coffee into the black cocoa, whisking well. Add the cream and whisk until combined. Slowly add the cocoa mixture to the creamed butter and beat well. A little at a time, add the flour and beat well after each addition. Bake at 350 degrees for 20-25 minutes. Be careful...this cake can be over-baked quite easily and get a bit dry. Cool. 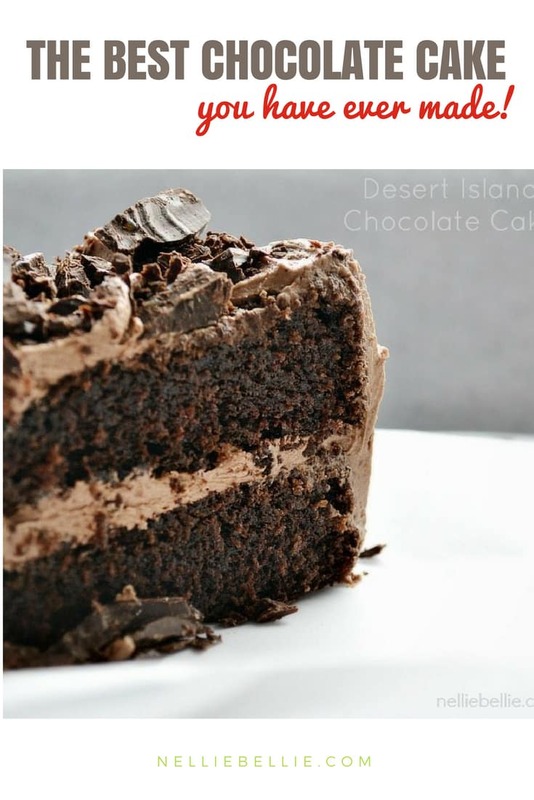 The BEST chocolate cake from scratch recipe. That fool-proof, everyone loves, chocolate cake I was telling you about? This is the one. No joke…everyone loves it. The highest rated cake on my site. It is virtually impossible to get wrong. And probably the best tasting bite you’ll ever have in a cake. Soooo good! I sure do make alot of bold claims with these cakes, don’t I? But really, I’m that confident that you’ll make them and never look for another recipe. 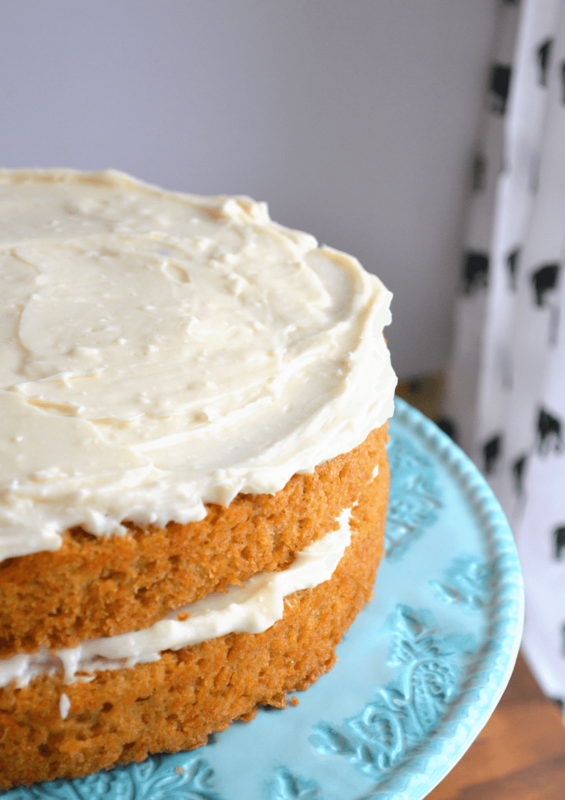 This carrot cake is one of those. A golden standard.